Aren’t bookstores just the best places? There’s a new adventure (and a new lesson) everywhere you look. I tend to plan a lot of lessons using children’s books, largely picture books. This is because I believe in an important principle: Picture books are not just for children. Good picture books share important ideas in succinct form—perfect for sharing in the bite-sized bits of time we have in most classes. 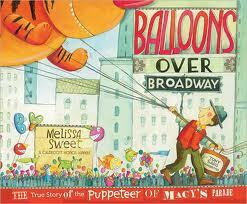 Today’s picture book, Balloons Over Broadway by Melissa Sweet, is one such book. Balloons Over Broadway tells the story of Tony Sarg, the puppeteer who first brought enormous balloons to the Macy’s Thanksgiving parade. Sarg’s story is a story of change, innovation, and persistence. There are many of ways to use the book to teach about the creative process or characteristics associated with creativity. But I’ll focus on just one: SCAMPER practice. SCAMPER is one of the basic divergent-thinking strategies introduced in the Teaching Creative Thinking tab above. If you are not already familiar with it, you’ll want to take a look. If you’ve taught the SCAMPER questions (strategies) to students, Balloons Over Broadway gives you a great chance to identify them. See how many SCAMPER examples your students can find within the story—real world SCAMPER in action. Here are some of the examples I found. I know you can find more. Substitute: Macy’s needed to substitute something for the live animal floats that frightened the children. Combine: Sang combined several rubber blimp-like sacks to create a long puppet. Adapt: Sang adapted his experience with marionettes to help him design the balloons. Minify/Magnify: Clearly the Thanksgiving parade balloons are magnified! Put to Other Use: Sang contacted a company that made blimps out of rubber. He asked if they could make huge balloon puppets from the same material. Eliminate: The first parade balloons were controlled by wooden sticks. Sarg was accustomed to working with marionettes, but eliminated the strings to control the first balloon puppets. Reverse: But in the end, the rod-controlled balloons couldn’t fly high enough for the parade crowds to see. Sarg reversed the typical way strings were used to control puppets, going from strings above to strings below the balloons steering them through the crowd. Take a basic song or melody. Experiment with using SCAMPER verbs to change it.